Foss House in Foss, near Tummel Bridge sleeps 10 people. 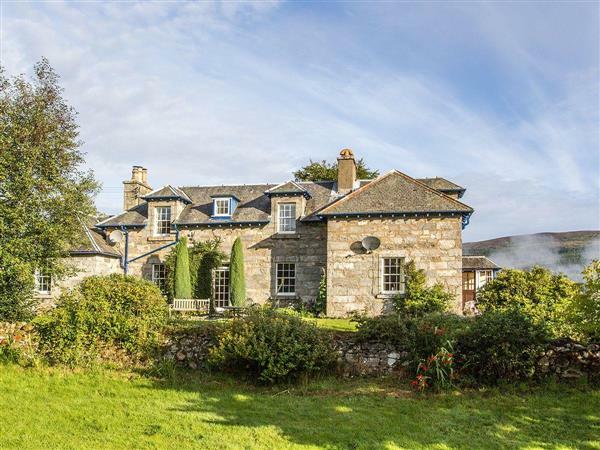 Foss House near Tummel Bridge is a magnificent country home, situated in one of the most picturesque areas of Perthshire, with views down to the Loch Tummel Valley. Foss House near Tummel Bridge is a detached property which is accessed by a rough track and is nestled within an ideal location to enjoy the outdoors, away from the hustle and bustle of city life. The grounds extend over 2 acres, where there is a stone garden to enjoy with beautiful views over Loch Tummel, as well as a large pond and stream at the bottom of the garden. There is a delightful decked area with a private hot tub for guests to take advantage of, which provides a perfect spot to relax and take in the peaceful surroundings. The local estates provide a wide range of outdoor sporting activities, such as shooting, stalking and fishing, which can all be enjoyed by arrangement with the owners. There are mountains to climb, historic castles to enjoy, whisky distilleries and local beauty spots to visit. The nearby towns of Aberfeldy and Pitlochry provide all necessary amenities with local shops, cafés, restaurants and art galleries. No matter how you spend your time, you can be rest assured that this fine house awaits your return, with a large formal dining room where the whole party can sit down around the table and enjoy a celebratory meal. Alternatively, head upstairs and relax, and unwind in the claw foot bath, or curl up with a book in front of the wood burner and truly immerse in this relaxing setting. The shop, pub and restaurant are 2 miles from Foss House near Tummel Bridge. Ground Floor: Living room: With wood burner, 32 Freeview TV, Xbox 360 and French doors leading to garden. TV room: With 55 Sky TV and DVD player. Kitchen: With breakfast area, oil Rayburn, electric oven, 6 ring gas hob, microwave, fridge, freezer, dishwasher, Nespresso coffee machine, bread maker and wooden floor. Pantry: With fridge, freezer, dishwasher and washing machine. Bedroom 1: With half tester king-size bed. Bathroom: With claw-foot bath, shower cubicle, toilet and heated towel rail. First Floor: Bedroom 2: With zip and link super king-size bed (can be twin beds on request) and en-suite with shower cubicle, toilet and heated towel rail. Bedroom 3: With zip and link super king-size bed (can be twin beds on request). Bedroom 4: With king-size bed and freestanding bath. Bedroom 5: With zip and link twin beds (can be super king-size on request) and en-suite with shower cubicle, toilet and heated towel rail. Oil central heating, gas, electricity, bed linen, towels and Wi-Fi included. Initial logs for wood burner included, remainder at £5 per basket. Travel cot and highchair. Stone garden with decked area, garden furniture and Bar-be-que. 2-acre natural woodland grounds (private). Hot tub for 7 (private). 2 dogs welcome - to be kept on a lead at all times (sheep country). Bike store. Private parking for 5 cars. No smoking. Please note: There are several steps and an unfenced pond in the garden. The property has a natural water supply from a borehole. Pets allowed at Foss House. For a better idea of where Foss House is, you can see Foss House on the map below. Foss House is in Perthshire; should you be on the lookout for a special offer, you can find all the special offers in Perthshire. It's always worth checking to see what is on offer at the moment. Do you want to holiday near Foss House (UK5220), you can see other cottages within 25 miles of Foss House; have a look to find your perfect holiday location.